Last month panelist Eduardo Machado ordered the transfer of Ovation.com in one of the most poorly reasoned UDRP decisions ever issued. Stephen Gilfus, the owner of the ovation.com domain, has filed in Federal Court in Florida to prevent the transfer by seeking a declaration under the Anti-Cybersquatting Protection Act that his use of the domain is legal. He is also seeking a declaration that Ovation Hair, the Complainant in the UDRP, is guilty of Reverse Domain Name Hijacking under the ACPA. 1. Gilfus acquired ovation.com for a substantial sum in 2008. 2. Gilfus used ovation.com as part of an online ticketing business. Archive.org screenshot from 2008 showing this use is available here. 3. Gilfus discontinued using ovation.com for the ticketing business in 2009 when the financial crisis hit. 4. After shutting down the ovation.com site, Gilfus transferred the domain to Register.com. Register.com put up a default coming soon landing page. 5. Ovation Hair applied for a US trademark in 2011 which was granted in 2012. 6. 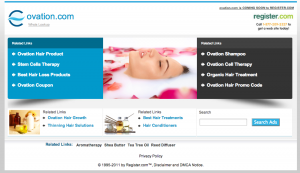 At the time the dispute was filed in 2013, ads were appearing on the Register.com default landing page for ovation.com that related to Ovation Hair. The coming soon page showed the Register.com logo and was copyrighted by Register.com. – Gilfus had a legitimate interest in the domain both because it is an inherently valuable generic domain that he paid a substantial sum for, and because he used it for a legitimate business purpose well before the commencement of the UDRP dispute. – Gilfus did not register the domain in bad faith because he acquired it well before Ovation Hair had protectable rights in its mark, and there was no evidence that he acquired the domain to target Ovation Hair. His use of ovation.com for his ticketing company is further evidence that he registered it in good faith. – Gilfus did not use the domain in bad faith because he did not profit from any of the links on Register.com’s default landing page, nor is there any evidence that he intended for Register.com to place ads on his ovation.com domain, nor that he was even aware of the Coming Soon page. The panelist did not have to be persuaded that all three of these conclusions were correct. Even a finding that the evidence supported just one of these would have been sufficient to deny the transfer. The Panel also finds that the provision in the registration agreement between Respondent and the domain name’s registrar indicates that the registrant is indeed responsible to determine whether the domain name registration or use infringes on another’s rights, and the registrant is responsible for maintaining the website and the content within it. Machado therefore found that Ovation Hair had demonstrated the three conditions that must be shown for a complaint to be successful, and so he ordered the transfer of ovation.com. The UDRP was intended only for clear-cut cases of cybersquatting. The three criteria that must be proven before a domain is transferred are intended to ensure that a transfer is only ordered when there is clear-cut abusive cybersquatting. The UDRP is now a perversion of what it was supposed to be. The three criteria can be thrown out the window. What the ovation.com case boiled down to is that an advertising link referencing the Complainant recently appeared at Ovation.com. That’s all it took to lose the domain. What makes this decision even harder to accept is that the offending links, which should not have resulted in the loss of the domain, appeared on a landing page that Gilfus had nothing at all to do with. Bad faith requires intent. Machado has turned the meaning of ‘bad faith’ inside-out as he has found that an absence of bad faith still qualifies as bad faith intent. While Gilfus is being hit with a severe penalty for the inadvertent display of an ad related to a trademarked use, Google is reaping windfall profits for intentionally displaying competitors’ ads when users search for a trademarked brand name. Google has been hauled to court multiple times by brand owners unhappy with Google for displaying ads of competitors when a user is searching for information about the brand owner. But Google is winning these cases, as the judges are finding that Google’s conduct is allowed under the law. We are now seeing greater and greater divergence between the intellectual property rights granted to trademark owners in the UDRP and the rights they have under US law. Machado is not solely to blame for this result. As justification for his decision, he cited the ‘next new thing’ in UDRP practice. This new thing is an overly clever attempt to gut the UDRP by eliminating the requirement that a domain must be found to be registered in bad faith before it can be ordered to be transferred away from the domain owner. This is the paragraph 2 approach that I critique in detail here. The ovation.com decision is the clearest example one could ask for of the unjust decisions that result from indiscriminate application of the paragraph 2 approach. Fortunately the discarding of the ‘registered in bad faith’ criterion by some panelists appears to be provoking a backlash by other panelists who reject this paragraph 2 approach. A discussion of this will need to be a subject of a separate post. In the meantime, Gilfus now faces the hassle and expense of trying to correct this atrocious decision by going to Federal Court. Perhaps some good will come of this if the court’s decision makes clear that the law requires that the intention of the domain owner at the time of the domain registration must be taken into account, and may not be disregarded. Eduardo Machado making money for lawyers while getting paid to do it. Favoring the trademark holder and stealing from the rightful owner. In UDRP you get what you pay for. Respondent opted for a single panelist. WHY??? Konstantinos – thanks for the comment. While it is probably a good idea to request a three-member panel, the benefits of a 3-member panel are likely overrated. In a 3-member panel, the Respondent and the Complainant each have a say in selecting one of the panelists. The arbitration provider selects the candidates for the third panelist, who takes on the role of presiding panelist. As the Complainant will likely select a panelist whose viewpoint favors its position, as would the Respondent, the panelists for the Complainant and the Respondent often cancel each other out, in effect, so then even with a three-member panel one is left with one’s fate still in the hands of the single, remaining panelist whose decision will tip the result one way or the other. There are still benefits to using a 3-member panel. If one of the panelists is inexperienced and is taking a position that one or both of the other panelists thinks is misguided, then there is a chance for persuasion and perhaps to convince that panelist to change his approach. Also the respondent has some say in which panelist is selected as the third, presiding panelist. That said, if you are domain investor and the Complainant is successful in selecting as one of the panelists someone is hostile to domain investors, then you are largely at the mercy of whomever is selected as the presiding panelist, which makes the situation not much different than going with a single-member panel. Usually the list of candidates for the presiding panelist is of a much better quality than the quality of the “random” allocated single panel. Usually in a list of 5 candidates there no more than 2 anti-domainer panelists so I have had great luck disqualifying them. Also when you are a panelist it is not so easy to make a bad decision (because you know it’s bad and most of the panelists know this, they are not stupid, they are just pro-tredemark) when you know that the more experienced colleague will out you in the dissent below. And generally speaking 3-member decisions get more attention from the panelists because, as I have said many times, both parties are paying customers to the arbitration provider. All good points. One thing I was surprised to learn from attending the WIPO workshop is that WIPO staff will often intentionally pick a less experienced panelist as the presiding panelist if they see that both of the co-panelists are quite experienced. We look forward to the decision which should be in the domainers favor and would be a nice ‘case history’. Yes, let’s hope so. Though litigation is unpredictable. There’s also a chance that the case would settle without a published opinion. About one year later, this case was settled and I still retain the domain name. Not enough substantial evidence to support bad faith argument or validate inappropriate use. UDRP did not review details appropriately.